I've been with Virgin - 50mbs package for a few months. 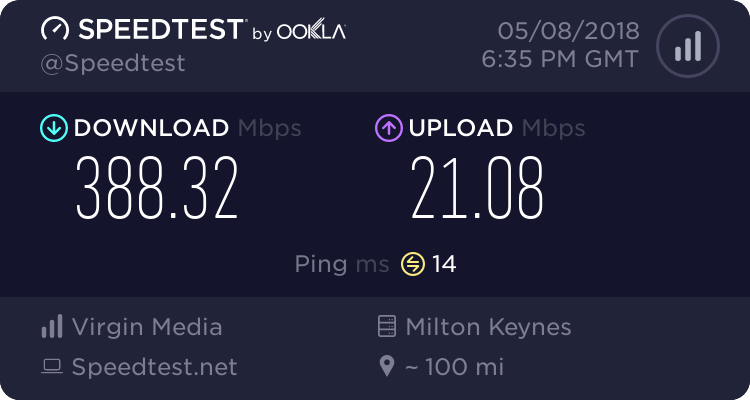 Not a hitch at all running with the Super Hub 3 in modem mode with Netgear Orbi attached. My only downtime was when new SH firmware was installed a month or so ago. Now on 9.1.116.608. Binning them on the Voom 3 business service here. I am aware of some of their plans for future products, though not the specific timelines and regardless they don't impact me as they're unlikely to be with us in time. Their 350/20 will be replaced by 2 x 65/19.5 VDSL lines that will use secret sauce to bond them. Hi, do we know if there are any further plans to expand service to villages surrounding Thanet? Would be nice to have the service available in Minster & Monkton. I only know what CLOKent posted in this post, which is Minster would be considered at a later date. If you get as many locals as possible to register an interest it might help. You could also PM CLOKent to find out if they know anything. Carl is it because of the possible future rollout of DS-Lite you moving away? I'm pretty sure the major reason is lack of upload speed. ok thanks guys, the second link has access denied. I know that my street in Broadstairs has gone live and Virgin are accepting orders. However, I note that only the Vivid 200 (Or whatever it is called) is the max available. I was looking forward to the fastest internet speeds. Is it normal for an area NOT to have the fastest speed available upon launch? I had exactly the same issue when our's went live. I PM'd @CLOKent and they managed to get the issue sorted, apparently they hadn't set something up to say the area was capable of supporting Vivid 350. Their words were some paperwork hadn't been checked and uploaded and once done it basically required a switch to be flipped. PS. Welcome to the forums. I've just PM'd clokent as Crow Hill is still not showing any availability and it's 6 months since they ruined our pavement and blocked the drains installing it. We have a VM box about 30 yards don the road which was worked on months ago. A bit academic now as I had to re-contract with TT for 18 months but at least I was able to negotiate a very cheap deal. sadly my building on blements road still never got cabled despite there being cables right outside it and t-junction's right outside too :/ ended up recontracting to plusnet guess ill try again when i move out of here. I'm on VMB. My public IP addresses are going nowhere whether running over static or dynamic. Unfortunately my road is showing as active, tried getting it and they fitted the box to the front of our house (Poorly), only to find out that the cable was blocked somewhere between the grey box and our house. They said it'll take up to 6 weeks to resolve. That was in September. On the verge of giving up. VM support is awful.